Hiking, traveling, and just enjoying nature are activities that are not as popular as they used to be. People tend to despise bugs and to fear running into dangerous wildlife, such as bears. However, what probably keeps people away from the wilderness the most is not knowing how to navigate through thick trees, winding paths, and unfamiliar territory. The fear of getting lost can discourage any potential hiker from taking his or her first steps down a forest path. While GPS and other navigation technology are much more advanced than they used to be and adjust compass declination automatically, there is no guarantee they won’t breakdown in the middle of a trip. That’s why it’s best to know how to adjust compass declination on your own so that you can minimize the chances of getting lost in the wilderness. 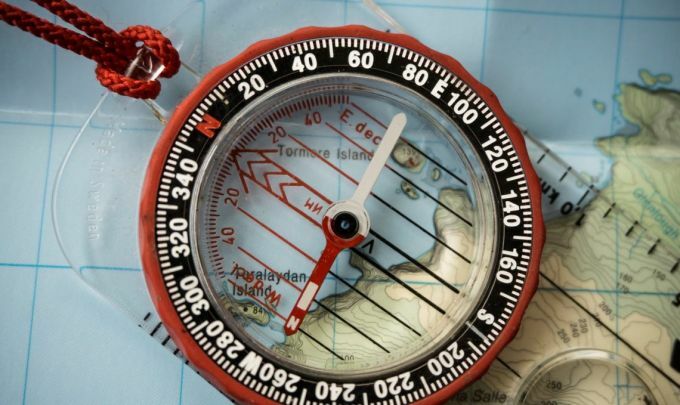 So, whether you are a new hiker eager to get started, or an expert hiker who needs to brush up on his or her navigational skills, this guide will teach you everything you need to know about keeping your compass pointed in the right direction. Also, make sure you read our article on how to use a compass if you need to brush up on this basic survival skill. You may have been camping before, but there are specific terms that not every camper knows. Being aware of them can make all the difference in the world, especially if you’re traveling by map. For those who are not avid hikers, the difference between the geographical north pole and the magnetic north pole might not sound like a big deal. However, the difference is more important than you might realize. Despite what many people might believe, a compass does not point due north. Due north refers to the geographic north pole, which is determined by the Earth’s axial rotation. The geographic north pole is also what a map’s compass refers to. So, if a compass does not point towards the geographical north pole, then what does it point to? The answer is magnetic north. The reason the two north poles are not the same, is because the magnetic north pole is not in line with Earth’s axial rotation and it is dependent on location. For example, the magnetic north pole in Florida is going to be different than the magnetic north pole in Washington. The difference between the geographical north pole and the magnetic north pole is referred to as magnetic declination, compass declination, or declination for short. While knowing the exact wording to use may not be life-or-death, knowing what magnetic declination is could be. Individuals who are not aware of magnetic declination could find themselves lost in unfamiliar territory. Therefore, it is important to not only know what compass declination is, but how to correctly navigate despite it. Calculating compass declination might sound overwhelming, but this how to adjust compass declination guide will break each step down. In no time adjusting your compass will seem easy. The process of compass declination may seem difficult at first, but once you’ve practiced these steps a few times in different location, you’ll become a natural. As already mentioned, the magnetic north pole changes depending on where you are located. In the United States the declination angle ranges from 26 degrees East in Alaska to 21 degrees West in Maine. Therefore, it is important to know the declination angle before starting a trip, or to at least know how to find out what the angle is upon arriving at your starting destination. There are websites that list a city’s latitude, longitude, and magnetic declination angle, which makes it possible to look up an area’s declination angle ahead of time. However, using a website probably is not the best option if you need to always be aware of what direction you are heading in. Instead, use a topographic map. They have a lot of essential information printed on them, including the declination angle. The angle should be located on the lower left part of the map, but there are a couple of different ways it could look. It could look like 2-D version of a compass, with one arrow pointing East or West, or it look like an ordinary angle, kind of like the ones you would see in a math book. For the most part, reading the declination angle on a map is simple. If the declination angle is printed to look like a compass, the angle degree will be in the middle and will look something like this: Approximate Var 2°15’ W. The first number represents the declination angle, the second number represents minutes, and the letter represents east or west. An arrow pointing to the right means the declination angle is to east. The angle degree may be listed as just a whole number, printed next to or in the angle. The angle degree may also be listed as a whole number over distance. For example: 2°15’/130 MILS. When hiking, bringing an updated map to navigate from is the best idea. An updated map is more likely to have an accurate declination angle printed on it. Unfortunately, the declination angle changes every year. This means taking the time to recalculate the declination angle before starting your hike is incredibly important. Topographical maps should have the year the map was printed, as well as the yearly declination change, listed next to the declination angle. Then add the overall angle change to the second number (minutes). Add 28’ + 15’ = 43’. The new angle would be 2°43’ W.
This step is the same. Multiply 7 x 4 =28. Now subtract the overall angle change. 15’ – 28’ = 47’. The new angle would be 1°47’ W.
Unfortunately, recalculating the current declination angle is not always this simple. The angle does not consistently change each year, so calculating the angle this way will only provide a close estimate. Getting a 100% accurate number will require looking up every angle change that has happened in previous years. For those who are not good at math, looking up examples to practice on is a good idea. This way you won’t have any doubts about your ability to navigate correctly. It may also be a good idea to consult an expert, or to just purchase an updated map. Now that you know how to find and calculate the declination, it is time to make the proper adjustments on your compass. When purchasing a compass, pay attention to the type you are buying. Not all compasses come with a dial or screw that allows you to adjust the orienting arrow, which is the arrow that points north. If you don’t buy an adjustable compass, you will end up having to think a little harder about which direction is actually north. If you don’t have an adjustable compass, go ahead and skip to the next step, as this section won’t be much help. Adjusting your compass will be the easiest part of your trip, as it only requires moving the orienting arrow. Before adjusting the angle, take a quick look at your compass. Notice that the orienting arrow is pointed at 0°, due north. While it will probably be rare that you travel due north, it is still a part of hiking to remain aware of. Locate the screw, dial, or other method, that allows you to adjust the arrow. Most compasses come with an attached, flat screwdriver. Use that to turn the dial. If the angle is East, turn the dial so the orienting arrow points to the left. When you turn your compass back to the front, the arrow should be pointing to the right. If the angle is West, turn the dial so the orienting arrow points to the right. When you turn your compass back to the front, the arrow should be pointing to the left. Line the red part of the compass needle up with the newly adjusted orienting arrow. Now the compass is pointing at your new, correct north. Now that your compass is pointing in the right direction, you are all set to start your trip. The best part is you won’t have to adjust your compass again, unless you are traveling to a different location that has a different declination angle. If you are not sure if you are traveling to a location with a different angle, just look at your map. If you will be remaining within the map’s grid the angle will remain the same. If you are traveling outside the map’s grid you will need another map with information pertaining to that location. For individual’s that do not have an adjustable compass, don’t despair. There is not much of a difference in the way the compass will look. The main difference between an adjustable and a nonadjustable compass will become more noticeable when you start to navigate. Notice how the pointer index and the N on the bezel (the white ring with directions and lines printed on it) line up. This indicates that the compass has not been adjusted. Turn the bezel ring so that the N lines up with the declination angle. For example, if the angle is 15°W, turn the ring so that the N is pointing 15° to the west. When the angle is to the west, turn the bezel ring counter clockwise. Line the red part of the compass needle up with your adjusted north. Now the difference between an adjustable compass and a nonadjustable compass is where north is pointing, which will affect how you navigate. With an adjustable compass, the pointer index and the N will still line up, even after you have adjusted for magnetic declination. This means when you use your compass with your map, your compass is already lined up with the directions on your map, making navigation much easier. However, with a nonadjustable compass you have adjusted where north is located, which means the pointer index and the N no longer line up. Therefore, when looking at a map you will have to turn your compass until it matches the same direction north is on the map. This makes navigation more difficult, as it will require more calculations to make sure you are going in the right direction. 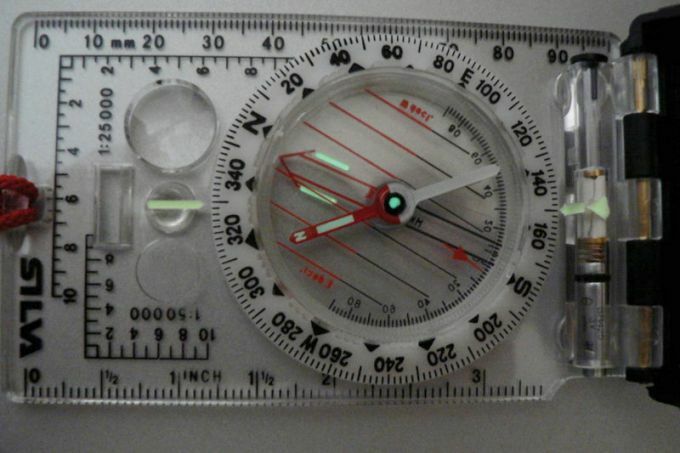 In summary, adjusting your compass to compensate for magnetic declination is easy. It only requires the turning of a dial or a ring to make sure your compass is always pointing you in the right direction. It is knowing what the declination angle is that can get slightly confusing. Finding and calculating the angle can be difficult as well. However, with the step-by-step process this guide has provided, it won’t take long for you to become a master at it. All it takes is a little practice to make calculating and adjusting magnetic declination seem like second nature. In no time, you’ll wonder why you ever thought getting lost was a possibility. So are you ready to take your first hiking steps? Please share any tips or tricks you’d like to share with other readers in the comments section below. For more tips on how to survive in the wild with nothing, check out our earlier article on this topic.